Do you love boats, or have you always wondered how the motors work on marine equipment? With a career as a marine technician, you’ll be able to learn about the mechanical side to the underwater and aquatic machinery that you know and love. Let’s dive into the world of a marine technician. A marine technician, or marine mechanic, is someone who services and repairs motors on boats and other aquatic equipment. You could consider them a boat doctor, they are the people who make sure all of the intricate parts of sea machines are running smoothly. Some of the boats that you may work on as a marine technician are fishing boats, yachts, cruise ships, and shipping boats. In this field you can expect to work in all types of situations, whether it be electrical, refrigeration systems, propellers, navigational equipment, and so much more. If you love to be outdoors, in the water, and surrounded by machines, then this career may be perfect for you. How Much Does a Marine Technician Make? The average marine technician salary in the US is $35,000 a year. Starting out, you’ll make roughly $20,000, but the more experience and training you get, the higher the pay. Those employees with the most experience can see an average salary of almost $60,000. If you want to work as a marine technician, you’ll need to find a place around water so that you’ll always have job security. You will find that with this career, the need for marine technicians peaks at different types. Typically during the summer the work load is full. While, in the fall and winter the jobs can be more scarce. July is the best month to work as a boat mechanic. While still in high school, make sure you take shop classes if they are available. After you graduate high school or get your GED, you are going to want to enroll in a trade school or vocational school to become a marine technician. Check out BoatUS.com for a list of marine technician schools near you. The classes you want to look for are motorboat maintenance and repair. You’ll also want to take blueprint reading, woodworking, and fiberglass repair. Once you decide on where you are going to go to school, you’ll need to study hard. Training is also going to get you where you want to go. Most employers want a marine mechanic with 1-2 year’s experience, so you’re going to have to work hard at training. It’s possible to obtain training with pay, where you can learn as much as you can in the field before you start making the big bucks. Check out local marinas or boat sales and service yards to enquire about helping, this will get you the training you need. The best training you are going to get is from a senior mechanic, so find your local boat technician and see if you can shadow them for a few weeks. This may end up with you getting employed as well! In order to work as a marine mechanic, you’ll need to get certified with the American Boat and Yacht Council (ABYC). This counsel provides different types of certifications for all water careers, including refrigeration and electrical. You’ll be able to take the classes in a town near you, or you can self study and test with a proctor. The training takes about two days, and then you’ll be able to show your skills to become certified. As long as you past the test, you will be able to obtain your initial certification as an advisor. If you want to be a technician, you’ll have to pass the exam, and also have at least 1 to 2 years experience. Certification are valid for five years, once that times is up, you’ll need to get re-certified, which consists of taking another exam. The certifications from the ABYC only last for five years, so if you plan to make this a long-term career, then you are going to have to brush up on your studies. Keep in mind that things change throughout the years, so you’ll always want to be one step ahead. The more experience you have, the better chance you’ll have at getting certified. Make sure you keep in the know about new certification procedures, as you’ll have to take some more courses to become certified once again. If you become certified in at least 3 different areas, you’ll be considered what they call a Master Technician. This means you’ll be an expert in the field, and the job outlook becomes even greater. 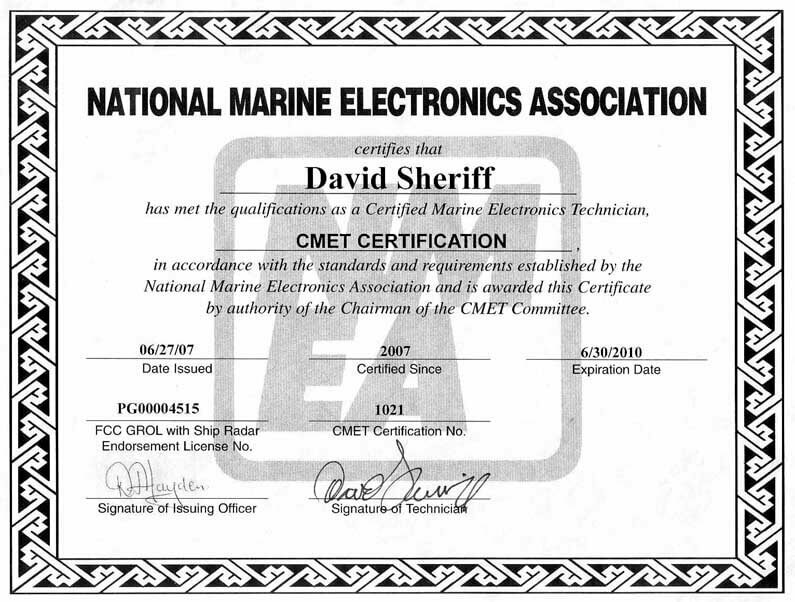 Whether you have a high school diploma or a GED, both are acceptable to apply for a marine technician job. It is advised to obtain some type of secondary education for this career. You can either go to a trade school, or to your local community college that provides degrees in marine technology. People with an associates degree are hired more often than those with high school diplomas. It is your choice whether you want to continue education after high school, but you can always go to a technical school, or start an apprenticeship if you do not want an associates degree. Education can last from about a year, to up to two years. Formal education is not as important as training, so make sure you get as much on the job experience as possible. A marine mechanic is one of those careers that has several different options for certification. These certifications can be obtained through the American Boat and Yacht Council (ABYC), but you’ll have to prove that you’ve been working as a marine technician for at least two years before you can become certified. Some examples of certifications include: diesel and gas engines, refrigeration and heating/cooling, as well as electricity and corrosion. You can get as many certifications as you would like, and if you get three or more, you’ll be considered a Master Mechanic! Certifications look great on resumes, so the more certifications and the more experience you have, the likelier it will be that you’ll be gainfully employed! The training program to become a marine technician lasts around one year. The expected growth for a marine technician is around 5 percent in the next ten years. This is not a fast-growing career plan, but it is important none the less. The economy tanking in 2008 was part of the reason why this career stopped growing as quick as others. The marine industry was almost cut in half this past decade. Most of the labor force before 2008 found jobs in other areas and have not returned to the marine industry. Working on boats and other aquatic equipment is important, as there are many fishing boats and marine machines that help in our everyday lives. Receiving an education will help you in becoming employed. That's a higher than average projected growth of -100 jobs. Should You Become a Marine Technician? The job satisfaction for a marine technician is very high, depending on the location that you work, there can be much opportunity to advance in this career. The average salary for a marine technician can range from $30,000 to nearly $60,000 with experience and education. The overall job outlook for a marine technician looks less than promising. The career has an estimated growth rate of 5% in the next ten years. Boat engines have become intricate, which means more labor and specialty are necessary to repair and maintain them. If you really want to do well in this career, you’ll need to complete post-secondary education. The course of getting your certificate can take about a year, while it is advised to at least get an associates degree, which can take around two years. Q. 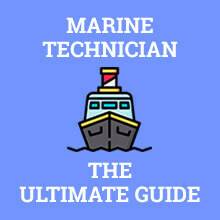 What is a marine technician? Marine technicians take care of the repairs and installation of boat motors, as well as other marine mechanics. Q. How much does a marine technician make? The average salary for a marine technician is $35,000 a year. Depending on your education and experience, you can make up to $60,000 a year. Q. How long is marine technician school? Some programs may take longer than others, but typically the courses take a year to finish. Q. What is the demand for marine technicians? This career is expected to have a slower than average growth over the next 10 years, but there is still a great need for boat technicians in certain industries. Q. How long does it take to become a marine technician? That depends on the type of schooling you decide to do, certificates don’t take as long, but getting an associates degree will help you look better to future employers. That means it can take from around one year to about two years.